Catechin /ˈkætɪtʃɪn/ is a flavan-3-ol, a type of natural phenol and antioxidant. It is a plant secondary metabolite. It belongs to the group of flavan-3-ols (or simply flavanols), part of the chemical family of flavonoids. (+)-Catechin and (-)-epicatechin as well as their gallic acid conjugates are ubiquitous constituents of vascular plants, and frequent components of traditional herbal remedies, such as Uncaria rhynchophylla. The two isomers are mostly found as cacao and tea constituents, as well as in Vitis vinifera grapes. Catechins are diverse among foods, from peaches to green tea and vinegar. Catechins are found in barley grain where they are the main phenolic compound responsible for dough discoloration. The taste associated with monomeric (+)-catechin or (-)-epicatechin is described as slightly astringent, but not bitter. Inter-species differences in (-)-epicatechin metabolism. Nanoparticle methods are under preliminary research as potential delivery systems of catechins. Cocoa catechins are under preliminary research for their potential to affect the risk of cardiovascular diseases. One limited meta-analysis showed that increasing consumption of green tea and its catechins to seven cups per day provided a small reduction in prostate cancer. (+)-Catechin and (-)-epicatechin are transformed by the endophytic filamentous fungus Diaporthe sp. into the 3,4-cis-dihydroxyflavan derivatives, (+)-(2R,3S,4S)-3,4,5,7,3′,4′-hexahydroxyflavan (leucocyanidin) and (-)-(2R,3R,4R)-3,4,5,7,3′,4′-hexahydroxyflavan, respectively, whereas (-)-catechin and (+)-epicatechin with a 2S-phenyl group resisted the biooxidation. Epigeoside (Catechin-3-O-alpha-L-rhamnopyranosyl-(1-4)-beta-D-glucopyranosyl-(1–6)-beta-D-glucopyranoside) can be isolated from the rhizomes of Epigynum auritum. The European Food Safety Authority established that cocoa flavanols have an effect on vascular function in healthy adults by concluding: “cocoa flavanols help maintain endothelium-dependent vasodilation, which contributes to normal blood flow”. Data from observational cohort studies have not shown a consistent association between flavan-3-ol intake and risk of cardiovascuar diseases. Depending on dose consumed, catechins and their metabolites can bind to red blood cells and possibly induce release of autoantibodies, resulting in haemolytic anaemia and renal failure. This resulted in the withdrawal of the catechin-containing drug Catergen, used to treat viral hepatitis, from the European market in 1985. Catechins released into the ground by some plants may hinder the growth of their neighbors, a form of allelopathy. Centaurea maculosa, the spotted knapweed often studied for this behavior, releases catechin isomers into the ground through its roots, potentially having effects as an antibiotic or herbicide. One hypothesis is that it causes a reactive oxygen species wave through the target plant’s root to kill root cells by apoptosis. Most plants in the European ecosystem have defenses against catechin, but few plants are protected against it in the North American ecosystem where Centaurea maculosa is an invasive, uncontrolled weed. ^ “Cutch and catechu plant origin”. Food and Agriculture Organization of the United Nations. 5 November 2011. ^ Rinaldo D, Batista JM, Rodrigues J, et al. (August 2010). “Determination of catechin diastereomers from the leaves of Byrsonima species using chiral HPLC-PAD-CD”. Chirality. 22 (8): 726–33. doi:10.1002/chir.20824. PMID 20143413. ^ Kríz Z, Koca J, Imberty A, Charlot A, Auzély-Velty R (July 2003). “Investigation of the complexation of (+)-catechin by β-cyclodextrin by a combination of NMR, microcalorimetry and molecular modeling techniques”. Org. Biomol. Chem. 1 (14): 2590–5. doi:10.1039/B302935M. PMID 12956082. ^ Pietta, P. G. (2000). “Flavonoids as antioxidants”. Journal of Natural Products. 63 (7): 1035–42. doi:10.1021/np9904509. PMID 10924197. ^ Tournaire C, Croux S, Maurette MT, et al. (August 1993). “Antioxidant activity of flavonoids: Efficiency of singlet oxygen (1Δg) quenching”. J. Photochem. Photobiol. B, Biol. 19 (3): 205–15. doi:10.1016/1011-1344(93)87086-3. PMID 8229463. ^ Janeiro, Patricia; Oliveira Brett, Ana Maria (2004). “Catechin electrochemical oxidation mechanisms”. Analytica Chimica Acta. 518 (1–2): 109–115. doi:10.1016/j.aca.2004.05.038. hdl:10316/5128. ^ Osman, A.M.; Wong, K.K.Y. ; Fernyhough, A. (2007). “The laccase/ABTS system oxidizes (+)-catechin to oligomeric products”. Enzyme and Microbial Technology. 40 (5): 1272–1279. doi:10.1016/j.enzmictec.2006.09.018. ^ Lin, Yi-Pei; Chen, Tai-Yuan; Tseng, Hsiang-Wen; Lee, Mei-Hsien; Chen, Shui-Tein (2009). “Neural cell protective compounds isolated from Phoenix hanceana var. Formosana”. Phytochemistry. 70 (9): 1173–81. doi:10.1016/j.phytochem.2009.06.006. PMID 19628235. ^ Aizpurua-Olaizola, Oier; Ormazabal, Markel; Vallejo, Asier; Olivares, Maitane; Navarro, Patricia; Etxebarria, Nestor; Usobiaga, Aresatz (2015-01-01). “Optimization of Supercritical Fluid Consecutive Extractions of Fatty Acids and Polyphenols from Vitis Vinifera Grape Wastes”. Journal of Food Science. 80 (1): E101–E107. doi:10.1111/1750-3841.12715. ISSN 1750-3841. PMID 25471637. ^ Freudenberg, Karl; Cox, Richard F. B.; Braun, Emil (1932). “The Catechin of the Cacao Bean1”. Journal of the American Chemical Society. 54 (5): 1913–1917. doi:10.1021/ja01344a026. ^ “Michiyo Tsujimura (1888–1969)”. Retrieved 10 November 2015. ^ Chun, O. K.; Chung, S. J.; Song, W. O. (2007). “Estimated dietary flavonoid intake and major food sources of U.S. Adults”. The Journal of Nutrition. 137 (5): 1244–52. doi:10.1093/jn/137.5.1244. PMID 17449588. ^ Vogiatzoglou, A; Mulligan, A. A.; Lentjes, M. A.; Luben, R. N.; Spencer, J. P.; Schroeter, H; Khaw, K. T.; Kuhnle, G. G. (2015). “Flavonoid intake in European adults (18 to 64 years)”. PLoS ONE. 10 (5): e0128132. doi:10.1371/journal.pone.0128132. PMC 4444122. PMID 26010916. ^ Kwik-Uribe C, Bektash RM (2008). “Cocoa flavanols – measurement, bioavailability and bioactivity” (PDF). Asia Pac J Clin Nutr. 17 (Suppl 1): 280–3. PMID 18296356. ^ a b c “Polyphenols in green tea infusion”. Phenol-Explorer, v 3.5. 2014. Retrieved 1 November 2014. ^ Pacheco-Palencia LA, Mertens-Talcott S, Talcott ST (June 2008). “Chemical composition, antioxidant properties, and thermal stability of a phytochemical enriched oil from Acai (Euterpe oleracea Mart.)”. J. Agric. Food Chem. 56 (12): 4631–6. doi:10.1021/jf800161u. PMID 18522407. ^ Charrouf, Z.; Guillaume, D. (2007). “Phenols and Polyphenols from Argania spinosa”. American Journal of Food Technology. 2 (7): 679–683. doi:10.3923/ajft.2007.679.683. ^ Cheng, Guiwen W.; Crisosto, Carlos H. (1995). “Browning Potential, Phenolic Composition, and Polyphenoloxidase Activity of Buffer Extracts of Peach and Nectarine Skin Tissue” (PDF). J. Amer. Soc. Hort. Sci. 120 (5): 835–838. doi:10.21273/JASHS.120.5.835. ^ Gálvez, Miguel Carrero; Barroso, Carmelo García; Pérez-Bustamante, Juan Antonio (1994). “Analysis of polyphenolic compounds of different vinegar samples”. Zeitschrift für Lebensmittel-Untersuchung und -Forschung. 199 (1): 29–31. doi:10.1007/BF01192948. ^ Quinde-Axtell, Zory; Baik, Byung-Kee (2006). “Phenolic Compounds of Barley Grain and Their Implication in Food Product Discoloration”. J. Agric. Food Chem. 54 (26): 9978–9984. doi:10.1021/jf060974w. PMID 17177530. ^ Kielhorn, S; Thorngate Iii, J.H (1999). “Oral sensations associated with the flavan-3-ols (+)-catechin and (−)-epicatechin”. Food Quality and Preference. 10 (2): 109–116. doi:10.1016/S0950-3293(98)00049-4. ^ Rani, Arti; Singh, Kashmir; Ahuja, Paramvir S.; Kumar, Sanjay (2012). 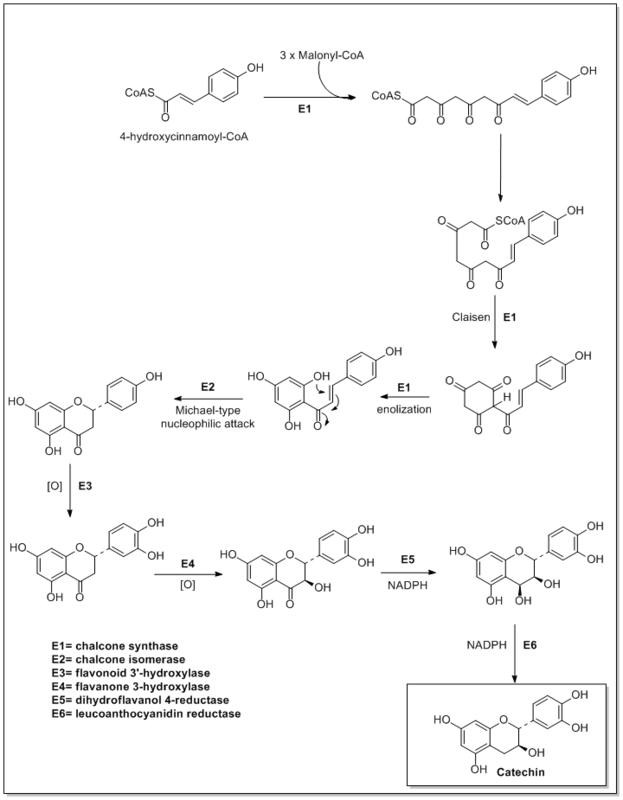 “Molecular regulation of catechins biosynthesis in tea [Camellia sinensis (L.) O. Kuntze]”. Gene. 495 (2): 205–10. doi:10.1016/j.gene.2011.12.029. PMID 22226811. ^ Punyasiri, P.A.N. ; Abeysinghe, I. S. B.; Kumar, V.; Treutter, D.; Duy, D.; Gosch, C.; Martens, S.; Forkmann, G.; Fischer, T. C. (2004). “Flavonoid biosynthesis in the tea plant Camellia sinensis: Properties of enzymes of the prominent epicatechin and catechin pathways”. Archives of Biochemistry and Biophysics. 431 (1): 22–30. doi:10.1016/j.abb.2004.08.003. PMID 15464723. ^ Skadhauge, Birgitte; Gruber, Margaret Y.; Thomsen, Karl Kristian; Von Wettstein, Diter (April 1997). “Leucocyanidin Reductase Activity and Accumulation of Proanthocyanidins in Developing Legume Tissues”. American Journal of Botany. 84 (4): 494–503. doi:10.2307/2446026. JSTOR 2446026. ^ Maugé C, Granier T, d’Estaintot BL, et al. (April 2010). “Crystal structure and catalytic mechanism of leucoanthocyanidin reductase from Vitis vinifera”. J. Mol. Biol. 397 (4): 1079–91. doi:10.1016/j.jmb.2010.02.002. PMID 20138891. ^ Arunachalam, M; Mohan, N; Sugadev, R; Chellappan, P; Mahadevan, A (2003). “Degradation of (+)-catechin by Acinetobacter calcoaceticus MTC 127”. Biochimica et Biophysica Acta (BBA) – General Subjects. 1621 (3): 261–265. doi:10.1016/S0304-4165(03)00077-1. ^ Hopper, Waheeta; Mahadevan, A. (1997). “Degradation of catechin by Bradyrhizobium japonicum”. Biodegradation. 8 (3): 159–165. doi:10.1023/A:1008254812074. ^ Sambandam, T.; Mahadevan, A. (1993). “Degradation of catechin and purification and partial characterization of catechin oxygenase fromChaetomium cupreum”. World Journal of Microbiology & Biotechnology. 9 (1): 37–44. doi:10.1007/BF00656513. PMID 24419836. ^ a b c d Ottaviani, J. I.; Borges, G; Momma, T. Y.; Spencer, J. P.; Keen, C. L.; Crozier, A; Schroeter, H (2016). 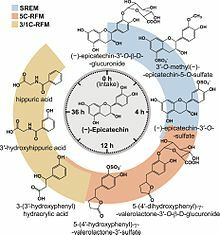 “The metabolome of 2-(14)C(-)-epicatechin in humans: Implications for the assessment of efficacy, safety, and mechanisms of action of polyphenolic bioactives”. Scientific Reports. 6: 29034. Bibcode:2016NatSR…629034O. doi:10.1038/srep29034. PMC 4929566. PMID 27363516. ^ Actis-Goretta, L; Lévèques, A; Rein, M; Teml, A; Schäfer, C; Hofmann, U; Li, H; Schwab, M; Eichelbaum, M; Williamson, G (2013). “Intestinal absorption, metabolism, and excretion of (-)-epicatechin in healthy humans assessed by using an intestinal perfusion technique”. American Journal of Clinical Nutrition. 98 (4): 924–33. doi:10.3945/ajcn.113.065789. PMID 23864538. ^ Ottaviani, J. I.; Momma, T. Y.; Kuhnle, G. K.; Keen, C. L.; Schroeter, H (2012). “Structurally related (-)-epicatechin metabolites in humans: Assessment using de novo chemically synthesized authentic standards”. Free Radical Biology and Medicine. 52 (8): 1403–12. doi:10.1016/j.freeradbiomed.2011.12.010. PMID 22240152. ^ a b c “Flavonoids”. Linus Pauling Institute, Oregon State University, Corvallis. 2016. Retrieved 24 July 2016. ^ Ottaviani, J. I.; Momma, T. Y.; Heiss, C; Kwik-Uribe, C; Schroeter, H; Keen, C. L. (2011). “The stereochemical configuration of flavanols influences the level and metabolism of flavanols in humans and their biological activity in vivo”. Free Radical Biology and Medicine. 50 (2): 237–44. doi:10.1016/j.freeradbiomed.2010.11.005. PMID 21074608. ^ Ye, J. H; Augustin, M. A (2018). “Nano- and micro-particles for delivery of catechins: Physical and biological performance”. Critical Reviews in Food Science and Nutrition: 1–17. doi:10.1080/10408398.2017.1422110. PMID 29345975. ^ Aprotosoaie, A. C; Miron, A; Trifan, A; Luca, V. S; Costache, I. I (2016). “The Cardiovascular Effects of Cocoa Polyphenols — An Overview”. Diseases. 4 (4): 39. doi:10.3390/diseases4040039. PMC 5456324. PMID 28933419. ^ Guo, Y; Zhi, F; Chen, P; Zhao, K; Xiang, H; Mao, Q; Wang, X; Zhang, X (2017). “Green tea and the risk of prostate cancer: A systematic review and meta-analysis”. Medicine. 96 (13): e6426. doi:10.1097/MD.0000000000006426. PMC 5380255. PMID 28353571. ^ Matsuda M, Otsuka Y, Jin S, et al. (February 2008). “Biotransformation of (+)-catechin into taxifolin by a two-step oxidation: primary stage of (+)-catechin metabolism by a novel (+)-catechin-degrading bacteria, Burkholderia sp. KTC-1, isolated from tropical peat”. Biochem. Biophys. Res. Commun. 366 (2): 414–9. doi:10.1016/j.bbrc.2007.11.157. PMID 18068670. ^ Shibuya H, Agusta A, Ohashi K, Maehara S, Simanjuntak P (July 2005). “Biooxidation of (+)-catechin and (-)-epicatechin into 3,4-dihydroxyflavan derivatives by the endophytic fungus Diaporthe sp. isolated from a tea plant”. Chem. Pharm. Bull. 53 (7): 866–7. doi:10.1248/cpb.53.866. PMID 15997157. ^ Bogs J, Downey MO, Harvey JS, Ashton AR, Tanner GJ, Robinson SP (October 2005). “Proanthocyanidin synthesis and expression of genes encoding leucoanthocyanidin reductase and anthocyanidin reductase in developing grape berries and grapevine leaves”. Plant Physiol. 139 (2): 652–63. doi:10.1104/pp.105.064238. JSTOR 4281902. PMC 1255985. PMID 16169968. ^ Friedrich, Wolfgang; Galensa, Rudolf (2002). “Identification of a new flavanol glucoside from barley ( Hordeum vulgare L.) and malt”. European Food Research and Technology. 214 (5): 388–393. doi:10.1007/s00217-002-0498-x. ^ Jin QD, Mu QZ (1991). “[Study on glycosidal constituents from Epigynum auritum]”. Yao Xue Xue Bao (in Chinese). 26 (11): 841–5. PMID 1823978. ^ a b Vogiatzoglou, A; Mulligan, A. A.; Bhaniani, A; Lentjes, M. A.; McTaggart, A; Luben, R. N.; Heiss, C; Kelm, M; Merx, M. W.; Spencer, J. P.; Schroeter, H; Khaw, K. T.; Kuhnle, G. G. (2015). “Associations between flavan-3-ol intake and CVD risk in the Norfolk cohort of the European Prospective Investigation into Cancer (EPIC-Norfolk)”. Free Radical Biology and Medicine. 84: 1–10. doi:10.1016/j.freeradbiomed.2015.03.005. PMC 4503814. PMID 25795512. ^ Schroeder, Johann (1655). Pharmacopoeia medico-chymica: sive thesaurus pharmacologeus. Ulmae Suevorum: Johannis Gerlini. ^ Berends, KAW (1829). Handbuch der praktischen Arzneiwissenschaft oder der speziellen Pathologie und Therapie. Berlin: Enslin. ^ Armentano, L; Bentsáth, A; Béres, T; Rusznyák, St; Szent-Györgyi, A (1936). “Über den Einfluß von Substanzen der Flavongruppe auf die Permeabilität der Kapillaren. Vitamin P”. Deutsche Medizinische Wochenschrift. 62 (33): 1325–1328. doi:10.1055/s-0028-1141260. ^ Hooper, L; Kay, C; Abdelhamid, A; Kroon, P. A.; Cohn, J. S.; Rimm, E. B.; Cassidy, A (2012). “Effects of chocolate, cocoa, and flavan-3-ols on cardiovascular health: A systematic review and meta-analysis of randomized trials”. American Journal of Clinical Nutrition. 95 (3): 740–51. doi:10.3945/ajcn.111.023457. PMID 22301923. ^ Ellinger, S; Reusch, A; Stehle, P; Helfrich, H. P. (2012). “Epicatechin ingested via cocoa products reduces blood pressure in humans: A nonlinear regression model with a Bayesian approach”. American Journal of Clinical Nutrition. 95 (6): 1365–77. doi:10.3945/ajcn.111.029330. PMID 22552030. ^ a b Khalesi, S; Sun, J; Buys, N; Jamshidi, A; Nikbakht-Nasrabadi, E; Khosravi-Boroujeni, H (2014). “Green tea catechins and blood pressure: A systematic review and meta-analysis of randomised controlled trials”. European Journal of Nutrition. 53 (6): 1299–311. doi:10.1007/s00394-014-0720-1. PMID 24861099. ^ Schroeter, H; Heiss, C; Balzer, J; Kleinbongard, P; Keen, C. L.; Hollenberg, N. K.; Sies, H; Kwik-Uribe, C; Schmitz, H. H.; Kelm, M (2006). “(-)-Epicatechin mediates beneficial effects of flavanol-rich cocoa on vascular function in humans”. Proceedings of the National Academy of Sciences. 103 (4): 1024–9. Bibcode:2006PNAS..103.1024S. doi:10.1073/pnas.0510168103. PMC 1327732. PMID 16418281. ^ EFSA Panel on Dietetic Products, Nutrition and Allergies (NDA) (2012). “Scientific opinion on the substantiation of a health claim related to cocoa flavanols and maintenance of normal endothelium-dependent vasodilation pursuant to Article 13(5) of Regulation (EC) No 1924/2006”. EFSA Journal. 10 (7): 2809. doi:10.2903/j.efsa.2012.2809. Retrieved 25 July 2016. ^ Martinez SE; Davies NM; Reynolds JK (2013). “Toxicology and Safety of Flavonoids”. Methods of Analysis, Preclinical and Clinical Pharmacokinetics, Safety, and Toxicology. John Wiley & Son. p. 257. ISBN 978-0-470-57871-1. ^ Bode, JC (1987). Assessment and Management of Hepatobiliary Disease. Berlin: Springer-Verlag. p. 371. doi:10.1007/978-3-642-72631-6. ISBN 978-3-642-72631-6. ^ “Ruhen der Zulassung für Catergen” (PDF). Deutsches Ärzteblatt. 82 (38): 2706. ^ a b Amanda K. Broz and Jorge M. Vivanco (2006). “Secondary Metabolites and Allelopathy in Plant Invasions: A Case Study of Centaurea maculosa”. Sinauer Associates; Plant Physiology and Development, Ed. 6; Lincoln Taiz, Eduardo Zeiger, Ian M. Møller, and Angus Murphy, editors. ^ Bais HP, Vepachedu R, Gilroy S, Callaway RM, Vivanco JM (September 2003). “Allelopathy and exotic plant invasion: from molecules and genes to species interactions”. Science. 301 (5638): 1377–80. Bibcode:2003Sci…301.1377B. doi:10.1126/science.1083245. PMID 12958360. ^ Yamamoto M, Nakatsuka S, Otani H, Kohmoto K, Nishimura S (June 2000). “(+)-catechin acts as an infection-inhibiting factor in strawberry leaf”. Phytopathology. 90 (6): 595–600. doi:10.1094/PHYTO.2000.90.6.595. PMID 18944538. ^ Chen Z, Liang J, Zhang C, Rodrigues CJ (October 2006). “Epicatechin and catechin may prevent coffee berry disease by inhibition of appressorial melanization of Colletotrichum kahawae”. Biotechnol. Lett. 28 (20): 1637–40. doi:10.1007/s10529-006-9135-2. PMID 16955359.